Several familiar faces return for Arrow's 150th episode presented as a documentary (featuring alternate takes and camera angles of clips from several episodes over the series runs) about Oliver Queen (Stephen Amell), vigilantes, and their role in Star City. Those returning include Quentin Lance (Paul Blackthorne), Sara Lance (Caity Lotz), Thea Queen (Willa Holland), Sin (Bex Taylor-Klaus), Barry (Grant Gustin), and Ragman (Joe Dinicol) who provide their own takes on Oliver and vigilantes along with interviews and sequences from the current cast of series regulars. 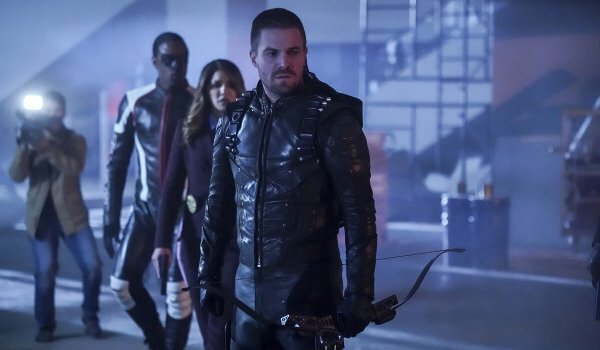 And when Oliver puts himself in harm's way to be lure out the villain of the week, the episode even offers the return of Team Arrow. The documentary-style of much of the episode offers its strengths and weaknesses, but overall the episode turns out well (and we do get more regular scenes between characters when not in front of the documentary crew). Along with the documentary filming, Oliver has an added objective in searching for the missing new Green Arrow (Sea Shimooka) who has been abducted by a new vigilante hunter who Curtis (Echo Kellum) gleefully names Chimera. Climaxing at a rally where the Mayor (Laara Sadiq) hoped to prove to the city why Green Arrow wasn't necessary, the ensuing battle does just the opposite in proving to the Mayor that vigilantes (at least deputized ones) may be in Star City's best interest after all. It seems Team Arrow is back. "Emerald Archer" also makes the return of a moody William (Jack Moore) still upset at being sent away to boarding school for her own protection and equally pissed and returning home... although he is happy to see Zoe (Eliza Faria), and, in the only scene from the dystopian future, the show gives us a short appearance by Shadowhunters' Katherine McNamara as Blackstar.